Thank you Toyoda-san for speaking with us today. Can you tell us about your background and present position? 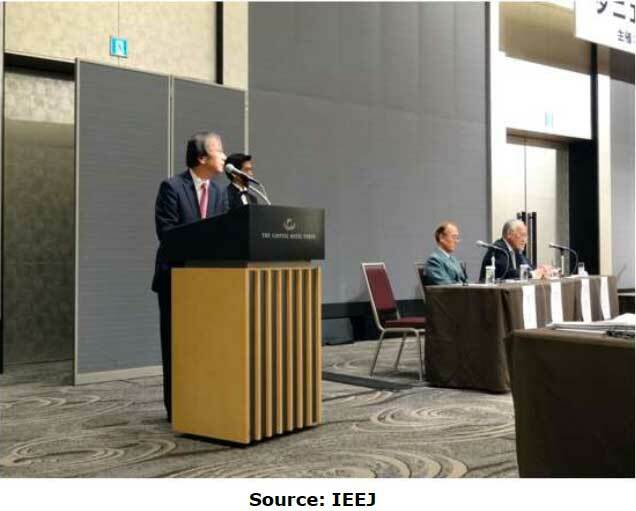 I currently serve as CEO and Chairman of The Institute of Energy Economics Japan (IEEJ) and assumed this position about two and a half years ago. My background is in government where I served for 37 years before I came to IEEJ. For the first 35 years I worked at the Ministry of Economy, Trade and Industry (METI), which had been known as the Ministry of International Trade and Industry (MITI) until it was reorganized in 2001. During my time at METI/MITI (see bio) I focused on a wide range of trade, economic, energy and environmental issues. This includes responsibility for the Kyoto Protocol negotiations and Japan’s participation in multilateral and bilateral trade negotiations including the Doha round and the US-Japan auto talks in the early 1990s. I resigned in 2008 after achieving the rank of Vice Minister for International Affairs and then began working as Secretary General for Space Policy in the Cabinet Secretariat of the Prime Minister. This was followed by assignments as a Special Advisor to the Cabinet on Asian Economy and then on Climate Change. So throughout my career I have been heavily involved in the development of Japanese policy in regard to energy, trade, manufacturing, industry, space, climate change and a range of other economic issues. 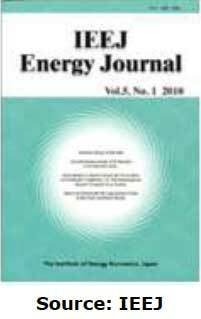 The IEEJ is active in Japanese and Asian energy-related issues and global environmental subjects. Can you tell us about the organization and its work? The IEEJ is a Japanese think tank on energy and environment. Our vision focuses on Asian energy and environmental issues from a global perspective and we not only analyze these issues but also propose policy solutions and recommendations. So our focus is not only on how these issues affect Japan, but rather how to view these concerns within a broader Asian context. Recently, we have also been undertaking more analysis on emerging economies such as the Middle East since so much of our energy is sourced from that region. We have four units, including energy research, climate change, geopolitics, with an emphasis on the Middle East, and economic modeling. In that last unit we make forecasts, not only for the short term, but stretching out to 2030 or 2050. Our goal is to determine what kind of energy mix will emerge in Japan and Asia and the world by that time so that we can analyze the significance and make suggestions. We have about 200 people in our institute and about 120 of them are researchers on various issues. In addition, we have administrative personnel and people on loan from other institutes and foreign governments. The Fukushima earthquake-tsunami and nuclear disaster had a devastating effect on Japan, due both to its physical and social impact, as well as how the nation manages its energy needs. Most notable is Japan's reduced reliance on nuclear power. How did the Fukushima disaster impact Japan aside from reconstruction costs, both from a broad as well as an energy perspective? What are your views on nuclear power, both in terms of Japan and as a global energy source? First, regarding the impact of Fukushima, I would say simply it was very serious and devastating. It also destroyed trust in nuclear power among the Japanese public overnight. 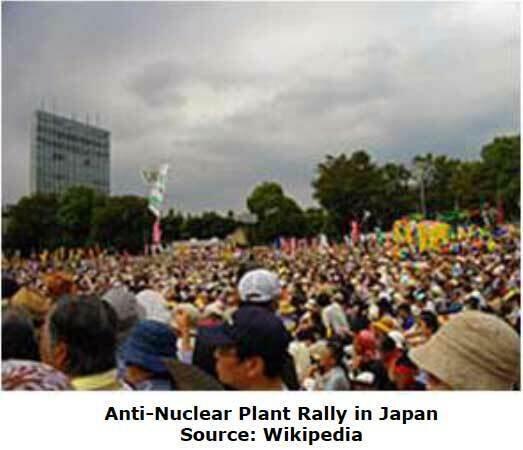 Most people became anti-nuclear or very skeptical at best regarding the safety of this power source. The previous government, which held power until the middle of December, was trying to reduce Japan’s dependence on nuclear power and in mid-September announced an innovative strategy on energy and the environment. The government envisioned taking measures to eliminate nuclear as a power source in Japan in 2030’s – but we had 54 power plants and the industry as well as major companies and many analysts expressed doubts about whether that would be possible – as did major governments around the world, including the US and UK. At present, public opinion is still highly divided, but what is interesting is that in mid- December there was a general election in Japan and the DPJ, who had been the ruling party, and who were in favor of eliminating nuclear, were defeated and the LDP came back. They had been saying it was irresponsible for the government to insist we can reduce nuclear power to zero and that Japan needs to take time to consider the best energy mix. So it is interesting that the public view is divided in this way and the LDP, who noted it is not possible to eliminate nuclear power, won an overwhelming victory. Clearly, the biggest priority in the campaign was not energy -- so it is important not to make too much of this. The main issue was economic revitalization and second, a range of social security issues. Energy was maybe the third most important. However, in any case Japanese opinion is still divided, but somehow most people are starting to consider the ramifications of Japan without nuclear and whether it can survive without it. My view is that we need to have a balanced approach and not over-rely on nuclear or for that matter any other energy source. We need to consider and utilize it in a balanced way. For example, maybe 20-25% of our electricity should come from nuclear, down from the 30% or so it represented in 2009-2010 before the disaster. That may not sound like a big reduction -- but before the disaster there had been plans to raise nuclear power to 50%, given its positive impact on climate change, as it has zero emissions. How has Japan's energy policy changed as a result of Fukushima and how do you see it evolving in the future? 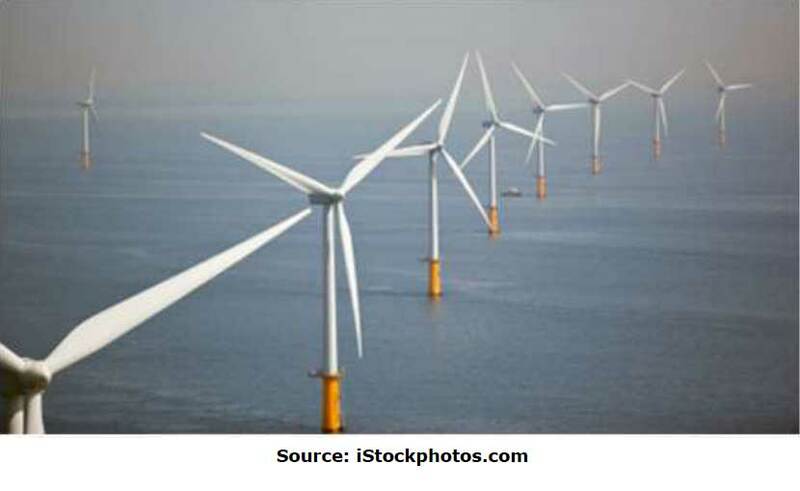 Is the planned shift toward a greater emphasis on renewable energy a viable one and if so, over what time frame? Additionally, what can be done to boost energy efficiency and to facilitate the development of new alternative energy technologies moving forward? After Fukushima the government realized they needed to review the current energy mix of the Basi Energy Plan made in 2010, and tried to shift Japan away from an overreliance on nuclear. They spent more than a year reviewing the issue and couldn’t conclude the discussion. For this review, METI formed a committee to consider fundamental issues in an Comprehensive Energy Review Council, which is an advisory organ for the METI Minister. They held more than 30 meetings over 13 months. I was one of 25 members but we couldn’t find a viable way to complete the shift away from nuclear power. Now under the new LDP administration, which was inaugurated at the end of last year, they are saying zero nuclear power is not realistic. This leads to two policy changes. First, within three years, they will restart existing nuclear power facilities after safety is reassured by the newly independent nuclear regulatory authority that is being formed to determine matters of this kind. Since it is subject to this review we don’t know how many plants will receive approval, though I assume that many will be and we will see them go back online within next three years. At this moment, however, only two are operational. 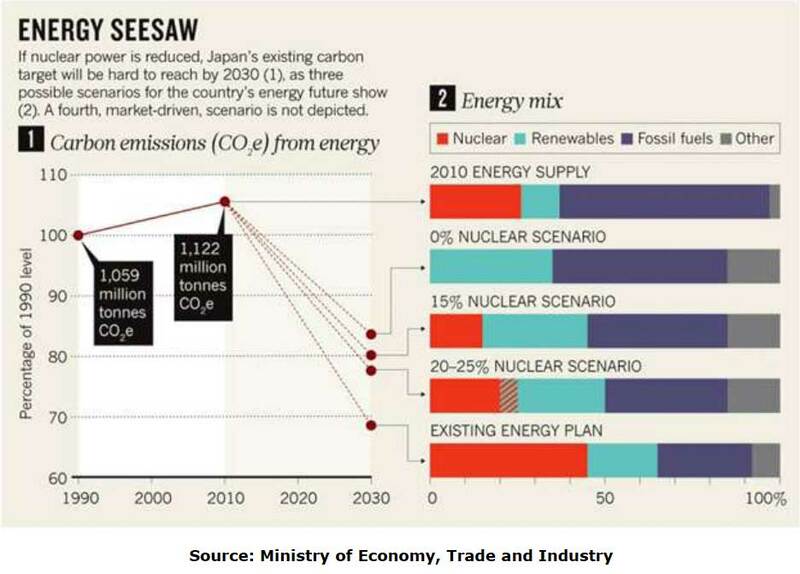 In the longer term, they will review Japan’s energy mix within next ten years. Renewables remain quite important and they will promote its development, but they must spend considerable time to test its reliability and viability as a power source -- especially given the large scale of utilization envisioned. At this moment they are saying that perhaps it is not possible to go zero nuclear and we will continue to shift toward renewable, but need a more balanced approach. In my view Japan should not proceed too hastily in adopting new energy mix goals, but ten years is too long to wait. After the independent regulatory authority sets up the new regulatory framework, which should be completed next July, we should proceed step-by-step. Nuclear plants should be restarted and perhaps one year after the feed-in tariff, which was implemented last July, we can see how effective that was and decide how reliable renewables have been. Then the new administration can reevaluate and decide what should be done. That takes us to about next autumn. How long will this process take? It is hard to say. But we need to start and cannot wait ten years. Conservation is also important. The previous administration was trying to promote conservation, which was necessary and appropriate and the LDP will also move in that direction. Japan is already perhaps No. 1 in the world by most measures, including energy consumption per unit of GDP, etc. but there is still room for improvement. This can also represent a business opportunity for Japanese companies in a world that is seeking to maximize energy efficiency. My recommendation there is also for a balanced energy mix. We need to think about economic security, environment, economic efficiency (cost), safety and macro impact, as this is a complicated equation and we cannot forget about the fact Japan is very energy poor and we need to import 96% of our energy from abroad. This is completely different from the US, which will now become energy independent due to the advent of shale gas and new exploration while we will continue to be dependent. Security, the environment, efficiency and cost are also indispensible and especially after Fukushima we cannot forget about safety. Energy costs also impacts our economy and if costs get too high, industry cannot survive operating within Japan. Renewables are also problematic, given problems of intermittency and cost, though petroleum is also unstable in terms of cost as well as political risks, which can send prices skyrocketing, so we must consider all of these factors. Therefore, while public trust is lacking in nuclear – nothing is perfect, so we must manage a balanced diverse portfolio. My view is a good mix might be 20-25% nuclear, 20-25% renewable and 50% fossil fuels – including petroleum, natural gas and coal, all balanced in terms of distribution. While Japan moves toward a greater reliance on alternative energy, there is still a need for traditional energy inputs such as oil and gas. 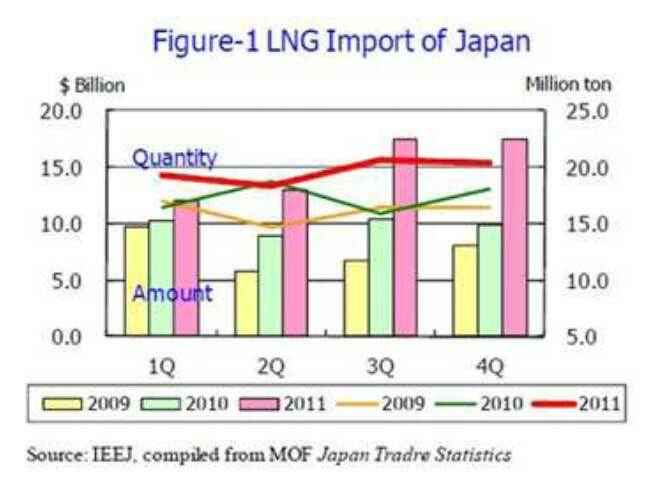 Where does Japan presently source its energy and do you see that changing in the future? How do you view the prospect of greater cooperation with Russia and other Asia-Pacific nations both in terms of resource supply and regional grid development? It depends on what energy source you are talking about. For oil we continue to be reliant on the Middle East as 87% of our petroleum is imported from there. We understand the need to diversify but don’t have appropriate alternative import sources. We are already importing considerable petroleum from Russia, and perhaps we can increase that, but the balance issue is important. 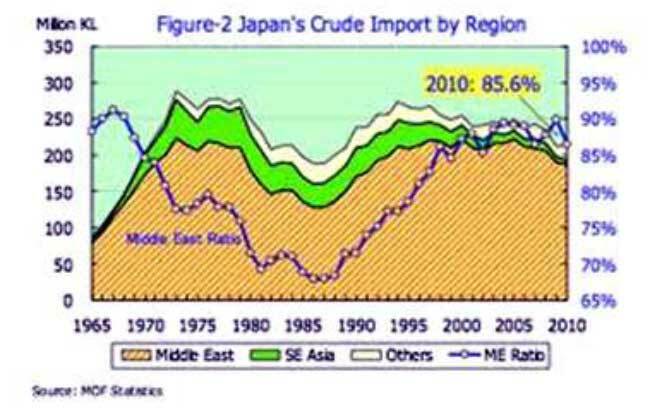 Perhaps the US could help Japan in terms of petroleum imports in view of its own increased supply by lifting their ban concerning the export of oil. For natural gas, our import source is more diversified. At the moment I think 40% of our supply comes from Asia and 30% from the Middle East, with the balance from Australia (16%), Russia (10%) and other sources, so this is more balanced. We also hope to import shale gas from the US though we understand that to import from the US, exports need approval from the US government but we do hope this will be possible. That is quite important as the US and Japan are important partners. We are supporting the policy of Iranian sanctions and have decreased our imports from there by over 50%, so it may not be too much to expect that the US will help us to secure the natural gas that we need. Here is the problem with Asian imports. We need to import liquefied natural gas from there, whose liquefaction and transportation costs about $6 per. This constitutes an “Asian premium”. In the US it is $3 per mm BTU at Henry Hub, but with liquefaction and transportation in Japan it can reach $16-18. That is 3-4 times higher even taking the additional cost for liquefaction and transportation, and we need to resolve that issue. The reason the price is so high is that the price is determined in link with petroleum, the unstable situation in Middle East, and demand factors in Asia, This creates differences in natural gas pricing here but hopefully the “Asian premium” can be resolved before too long. So we are importing lots of natural gas and considering how much more desirable that is given it is cleaner, hopefully we can diversify supply further through increased use of shale gas too. You entered METI/MITI during a very different time in Japan's history. Can you tell us about those early days and the factors that led to the collapse of Japan's bubble economy in the early 1990s? Why has economic recovery been so difficult and do you see any parallels and lessons learned that can be applied to the present economic environment in the US and EU? 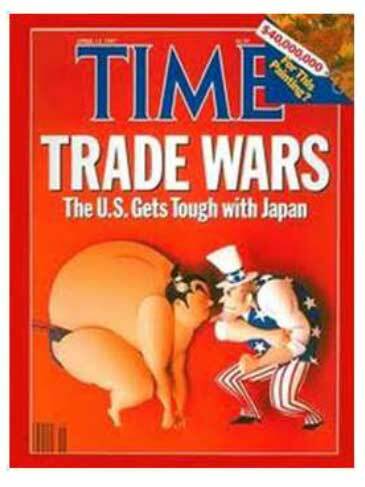 In the late 1980s/early 1990s we had unfortunate trade friction between US and Japan. I was 11 Director of the Americas Division of METI at that time, which was responsible for dealing with these matters. To resolve this trade imbalance the Japanese government was trying to take expansionary policies and because of that we increased imports and the bubble economy emerged. It was not as sustainable as we thought and in the early 1990s it collapsed. After that people say we experienced one or two lost decades and it took a very long time to fix the economy and I think the reasons are now understood. After the collapse most companies showed serious balance sheet damage. Assets shrank, so this increased leverage. Most corporations then tried to reduce debts even when the government tried to convince them to expand, and even though interest rates were lowered almost to zero there was little new borrowing. So investment was negligible and it was a vicious cycle that reinforced itself over time. Salaries did not increase or declined and with that consumption stagnated as well. Then debts could not be lowered, which lead to reinforced attempts to do so. This caused increased deterioration to our economy. I think the lesson for the US and EU, which are now suffering from their own bubble collapse, after the Lehman shock and events in Greece -- is that monetary expansion by itself is not sufficient. The governments accumulated a lot of debt, but companies and households continued to suffer. They are not making investments so it is only the government that can do that, which increases public debt further. So the lesson from the lost decade is that monetary policy is important but not sufficient. Fiscal and structural reform and deregulation is also critical and necessary to shorten the readjustment process. 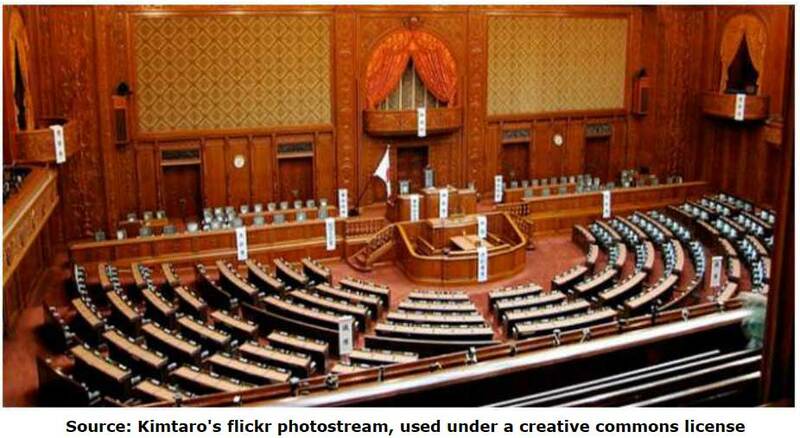 Japan has just held an election following numerous changes of government in recent years. Should we be hopeful about the results? How do you view the current political environment in Japan and in the words of a recent US News and World Report article, what will it take "to jolt Japan out of its 20-year economic slump"? The new LDP administration seems to be making the issue of economic revitalization their top priority and that is quite important and appropriate. Under the previous administration, they focused on income distribution rather than growth, and unfortunately there is no new income without growth. So I think the new priority is much better. Even before the election, Mr. Abe, the party leader, noted they would take up an expansionary policy after the election, and we began to see an immediate lift in the stock market, which got the message, and there was a significant rise. And after the election, Mr. Abe assumed the position of Prime Minister, and he continued with this talk and the stock market rise has continued. I think the Prime Minister is quite right in pursuing three kinds of expansion, including monetary, fiscal and structural, which I think will mostly take the form of regulatory reforms. So I think this is a more reliable and viable policy that we had in the past. Investors appear to also believe this and I think they can count on this new government. At the same time Japan has many attractions as a business and investment environment. It remains a very large and stable economy, which offers a high quality of life and standard of living. It also remains a global leader in many products, processes and technologies. What should foreign companies and investors know about Japan and why should they be considering it in their expansion and allocation strategies? This is a good question. Many people tend to forget important facts about Japan. Since economic growth in China was so spectacular, people tended to focus on this market to the exclusion of others, but that is now moderating and I think it is time for people – both inside and outside Japan -- to recognize the importance of the Japanese economy. First, Japan is still the world’s third largest economy after the US and China. And if you look at it in terms of GDP per capita, in countries with more than 100 million people, Japan is number two after the US. Most countries with high GDP per capita are smaller in size such as Singapore so while income may be high the market as a whole is not. But when you look at larger countries Japan remains on the top of the list. It is true that our industry is facing more challenges from countries such as Korea in areas including automobiles and machinery but we still rate very high. 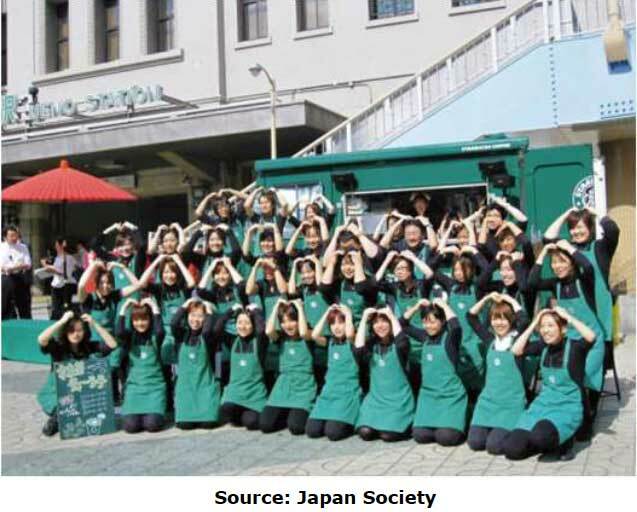 Japan also possesses an aging population, so services are very important. Our medical services and culture/content/tourism sectors are quite attractive as is food and food safety. Additionally, given our enhanced need for more safety following Fukushima, and as well as the resulting need for renewables and conservation, there are many opportunities in our energy sector. The 3/11 Fukushima accident was quite unfortunate, but this could serve as an opportunity to revitalize our nuclear and other industries. The new administration is quite right in looking at that as an area to emphasize where Japan has competitiveness and potential. Developed countries such as Japan, the US and those in the EU used to look at emerging economies primarily as platforms to lower operating costs and manufacture products for sale back in their own and other developed markets. Now they increasingly look to these markets for their ability to provide growth and demand. How is this trend effect Japanese government policy and corporate behavior? Can Japan serve as a gateway for foreign companies seeking to enter the markets of developing Asia? This is also an important question and it is quite right to say that emerging economies, particularly in Asia, were seen as simply factories for the world in the past, but they are now becoming important markets for products and services produced in developed countries. Now, emerging Asian economies are becoming the center for economic growth in the world, while developed countries remain stagnant. China, ASEAN and India – that is where the growth is coming from. And Japanese companies have made huge investments in factories, service centers, stores, supermarkets and other facilities and I think now it is time for Japan to enjoy economic growth as a result of these allocations. We have also invested in improving infrastructure and capacity in these economies. So I think we are in a good position to work together with these countries to develop their economies and regional development. At the same time, Japan used to be said to be a country of high costs. But fortunately or unfortunately we have suffered through a long period of deflation, so costs are now relatively reasonable. This is true when talking about transportation, rents and many other costs. That opens the door to basing facilities in Japan and I think the country can be a good gateway for US and European firms seeking to enter these markets. The US-Japan bilateral relationship has changed considerably over the course of your career. How do you view these changes and where do you see it headed moving forward? In addition, US-Japan corporate relations are cordial but there is far less cooperation than one might expect given the close relationship between our two countries. Why don’t we see more joint ventures, alliances and Japanese acquisitions in the US? As I said, by the mid-1990s the US and Japan had a lot of friction but that is now over and the time for greater cooperation has now come. We share common values, missions, trade and a desire to liberalize and create a 21st century investment infrastructure, which opens the door to cooperating across a range of areas. 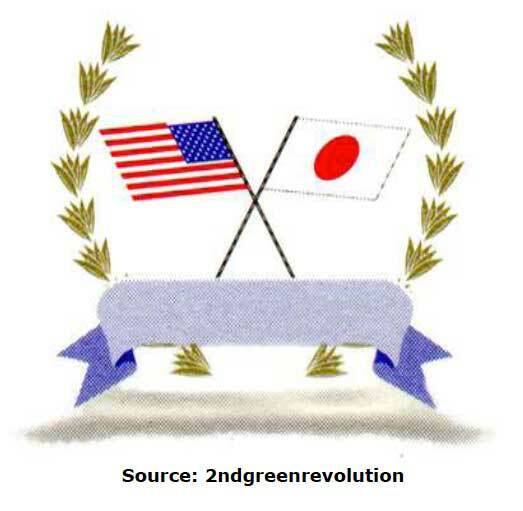 I also think the US and Japan can work together to address global issues such as climate change. The present negotiation framework may not have resulted in a successful conclusion, but perhaps our two countries can be more realistic. While technology is important, unless emerging nations such as China and India participate, we cannot achieve meaningful progress. 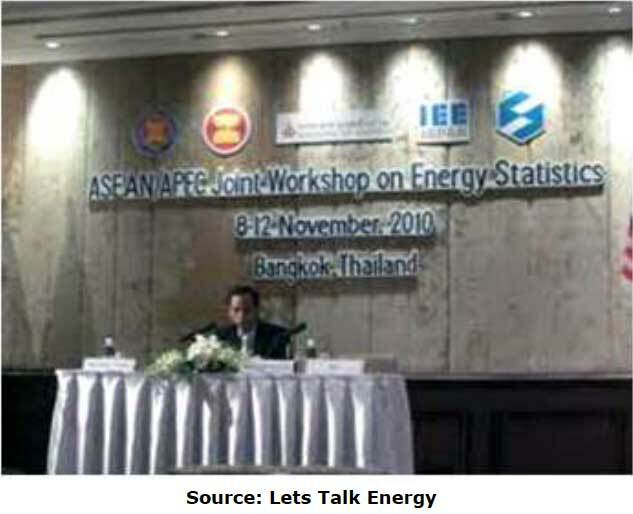 Before we talked of reduction in absolute terms as opposed to energy intensity. As a result, China and India could not join. They also realize the need to minimize emissions but that is not easy. Since these and other emerging economies are now the centers for global growth, they must participate to address those global issues, so energy intensity might be a good compromise. The US and Japan can also develop or build on frameworks where we can cooperate. This is especially true for energy, particularly nuclear and smart grid and conservation. In many ways we have already begun to do this. For example, Toshiba and Hitachi are working together with Westinghouse and GE. And in the smart grid area, there are many US companies that are good at promoting technology while Japan is good at conservation. We can combine these two skills to obtain many synergies so there is tremendous room for cooperation. China has become an increasingly important factor in the global economy and two years ago overtook Japan to become the second largest economy in the world. Now we are seeing a change in leadership, growing tensions in its relations with Japan and other nations in the region, as well as potential signs of economic deceleration. What do these changes mean for Japan and the world at large? 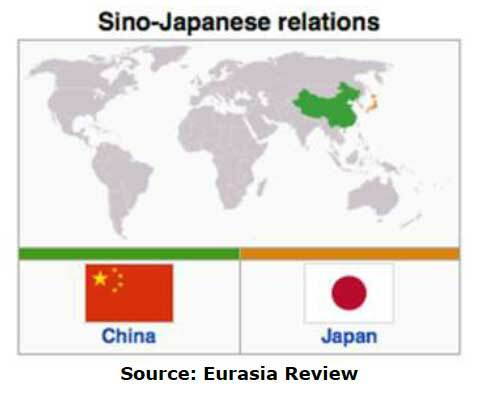 It is unfortunate that territorial disputes overshadow other issues in the China-Japan and Korea-Japan relationship rather than the need to cooperate to resolve common problems. Yes, trade and investment liberalization is one problem but Asian countries are also facing similar problems in regard to energy shortages and environmental problems. I can give you several areas of cooperation. For example, Japan is number one in terms of energy conservation and China and other Asian economies rely on Japanese technologies and practices in this sector. Aside from any direct commercial benefits, energy is a common good and if supply eases due to better conservation practices, we all benefit as prices go lower. Second, nuclear is also quite important, particularly in terms of addressing safety. There are about 60-70 nuclear plants under construction in the world and about 2/3 of those are in Asia, mostly in China and India. With our experience in Fukushima we can give valuable input on safety and help Asian countries. 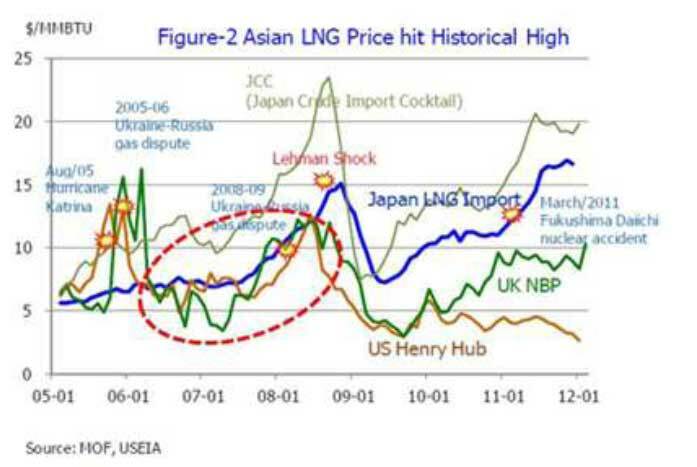 Asian economies also share the problem of reducing the “Asian premium” for natural gas. So we don’t need to confront one another and it is time to promote stronger and closer cooperation, as these territorial disputes cannot be easily resolved. Therefore we need to separate them from these other issues where we can benefit from closer cooperation. I hope this is possible and that we can count on experienced politicians in the LDP who have close networks and communications with Korea and China. Hopefully they can find sensible solutions for these issues so that we can all benefit. You have spent much of your career helping to further a wide range of bilateral and multilateral negotiations including but not limited to the Doha round, the Kyoto Protocol, and the US-Japan automotive talks. How do you view the environment for trade negotiations -- both bilateral and multilateral -- moving forward? What is the impact of the increased role that developing newly emerging nations okay in many of these forums today? 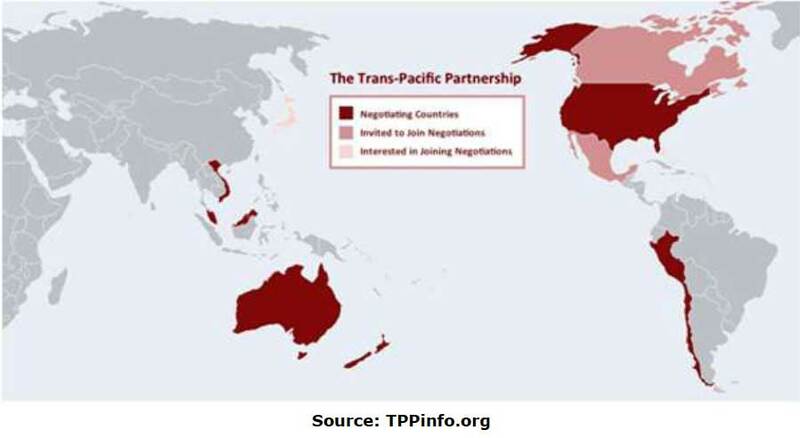 In addition how do you view the prospects for TPP and do you think that Japan will take the steps needed to participate in these negotiations? This is also an important question. You referred to multilateral negotiations and unfortunately on the basis of my experience, I don’t think these negotiations have a good prospect for successful conclusion. The reason is that the underlying premises have completely changed. In 2001 when the Doha Round was launched, we need to remember that China was not in the WTO. When they joined, they grew substantially and that was good for them and the world, but it changed the premise that developed countries were more competitive than emerging economies. The situation changed and these economies are also very competitive and huge investments are being made in these markets. So the premise that developed economies were strong and developing weak is no longer true. And we need to take into account this fundamental change and change the framework or the negotiation will not go anywhere. The same thing can be said about climate change. The Kyoto Protocol was negotiated in 1996. The premise then also was that developed countries were strong and developing weak and that differentiation of responsibility no longer holds. So emerging economies need to share the burden or a solution cannot be found. While we cannot be optimistic about the prospects for either of these negotiations if the US, Japan and EU can work together to help launch a new framework, as well as regional FTAs and other agreements such as TPP, we have a better chance and this is far more realistic. Unfortunately though Japan has not yet been able to participate. If this changes, and Japan can join TPP negotiations, there will be 10 countries of which 90% of GDP will be US and Japan. This offers the potential to develop a highly attractive framework for the 21st century. I then believe everyone including the EU will want to join and it will provide a framework that can be expanded to include whole WTO, so it is not really as regional as people think. For climate change, the US/Japan also needs to establish a more realistic framework so other countries can join. As mentioned, I think carbon emissions intensity rather than absolute reduction needs to be emphasized and new technology developed to reduce costs. For example, artificial photosynthesis can help in this regard and Dr. Negishi of Duke Univ. who won a Nobel Prize is advocating the importance of Carbon Capture and Use. New technology is needed and we must recognize in the next decade or two carbon emissions may not diminish due to growth in China and other emerging markets. So it is critical even if they improve emissions intensity quite substantially we have to adjust and adapt to that fact and change our frameworks accordingly. Thank you so much Toyoda-san for your time and attention. Before we conclude do you have any final words to leave with our readers? Well, again that people in Japan and all over the world can be hopeful for better performance in Japan due to efforts by the new LDP administration to make economic revitalization their main policy priority. We can also hope for more US-Japan cooperation to reframe all kinds of economic negotiations to bring prosperity to the world.